Trailhead and parking area are on Rt. 4/11 in Andover, NH. Park at the "Field Lot" in Proctor Academy. This is located at the end of Field House Lane, which leaves the north side of the road, 1.1 miles west of the eastern junction of Rt 4 and Rt. 11, and 1.6 miles east of their western junction. Field House Lane leaves the road across from the western side of a large lawn, at the far end of which is a baseball diamond. Ragged Mountain is located in western-central New Hampshire, between major hiking mountains Kearsarge and Cardigan. Ragged Mountain receives very little attention from hikers, who usually prefer the huge, open summits of those aforementioned. Ragged is best known by skiers, who cruise along its broad west peak's northern slopes. The true summit is the east peak, although the Ragged Mountain name is usually applied to the ski area peak. Hikers who prefer peaks with many viewpoints in different directions will be more than satisfied with Ragged Mountain. It has two notable knobs near the summit, Old Top and West Top, both of which have ledges with good views. The best access to Ragged Mountain is via the Sunapee-Ragged-Kearsarge Greenway which provides two routes up the mountain. The shorter route begins at a Proctor Academy parking area. Look for a wide gravel path at the far left corner of the parking area leading up to a tennis court. Walk a short distance up this, then bear right onto a ski trail. Look for SRKG blazes. Follow this for 0.3 miles into the forest, then, with a bridge in sight ahead, bear left across the slope off of the ski trail. Continue to watch carefully for trail markers, since this part of the route can be hard to follow. The trail soon swings uphill and climbs steeply, then quickly moderates as it approaches the top of a ridge. It proceeds to follow this ridge until it intersects an old road after half a mile from the last junction. Note: To the right, this road connects to the route to Mud Pond, allowing hikers to combine the two hikes. Turn left onto this road as it continues the easy ascent for the next 0.7 miles. At the end of this flat section, the trail crosses a dilapidated bridge, then steepens slightly. After another 0.3 miles, it passes through a logged area, crossing one noticeable logging road. Soon the road steepens significantly; at one point, the trail turns left and makes a switchback around a section of the road with loose footing. At the top of this section, the grade eases as the path travels across the slope, but soon steepens again. 0.3 miles after the bypass section, the trail flattens out in a broad col between the south slope of the mountain and a small knob. The trail swings right beyond the col and resumes its moderate ascent. In 0.2 miles, the trail reaches a junction with a local trail network built by the Proctor Academy. These trails are extensive and unofficial and can be hard to follow. For a worthwhile detour, turn right here, onto the trail marked "BAL RK" and follow it 0.1 miles to the interesting feature known as Balanced Rock, an oblong boulder precariously situated on a narrow ledge. Beyond Balanced Rock, the path continues a short distance out onto ledges with good views. Back on the main trail, it is another 0.2 miles to the summit ridge, where there is another junction. You will travel down both forks, so choose either the southern and western views (turn left) or the northern and eastern views (turn right) to visit first. The left fork continues the SRKG and runs with minor undulations, passing a new ski trail on the right, for 0.1 miles to a side path to a good viewpoint on the left. This ledge outcrop overlooks the town of Andover and Bradley Lake, with Mt. Kearsarge behind. For the next viewpoint, continue another 0.1 miles, passing an obscure signed path on the left, to a wide ledge near the summit of the knob known as West Top. This view, much wider than the last, looks out to the west, to the Green Mountains. It also overlooks the west (ski area) peak of Ragged Mountain. The right fork at the junction is a 0.4 mile long spur called East Ridge Trail. This trail crosses the summit of Ragged Mountain, then continues over several knobs to the open ledges at Old Top. This is probably the best viewpoint on the mountain, as it provides mostly open views to the north. You have a good view of the White Mountains, as well as Mt. Cardigan. 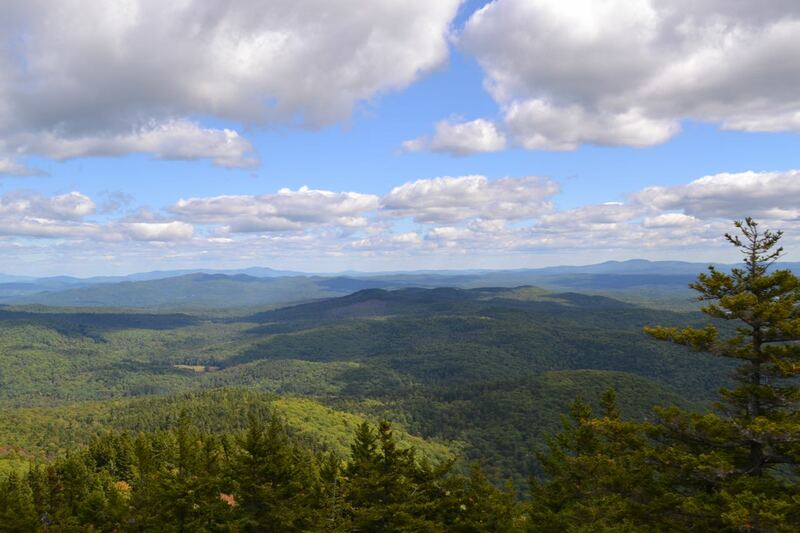 There is also an opening to the east, where you can see the Belknap and Ossipee Ranges.